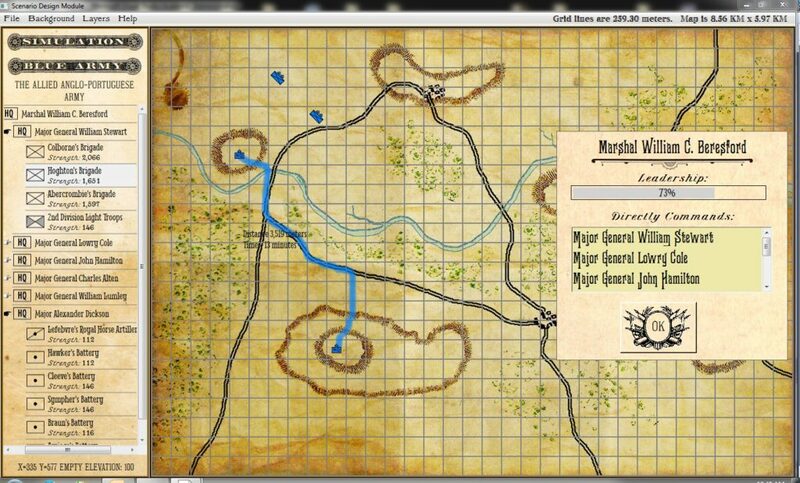 The Scenario Editor Module for General Staff allows the user to combine any two armies created in the Army Design Module with any map created in the Map Design Module and create a scenario or battle. In the screen capture before we’ve combined the Allied Anglo-Portuguese Army from the Battle of Albuera (May 16, 1811) as the Blue Army with Napoleon’s Imperial Guard as the Red Army and placed them on a map of our own design. Screen shot of the General Staff Scenario Editor. Note that the time to deliver orders via courier between units is displayed. Click to enlarge. Also, note that when you slick on a headquarters unit the route, distance and time that a courier will take to deliver orders to the next subordinate unite are displayed. This is just the beginning because General Staff is actually two wargames in one. We will be posting a video showing off some of the new features shortly. This entry was posted in Game Design, Scenario Design Module, Wargames and tagged Couriers, Headquarters, Scenario Editor on April 21, 2017 by EzraSidran.